I recently purchased a new sewing machine and to learn how to use it I jumped right into a project with some material I already had at home (the dark green pieces were cut from a tablecloth used at our wedding while the light green is the same material used in the kitchen curtains I recently made). The last time I made a "quilt" was in the 8th or 9th grade and for that "quilt" (you'll understand why the quotations in a few seconds) I just sewed together some squares for the quilt top and was not responsible for the batting and backing (see why the quotations?). This is a new journey for me. I've been researching my options online and it seems as if it comes down to personal preference and style. As you can see, I've come as far as I have in the past and now I am trying to learn how to take the next step! I'm an experimental type of person but typically expect things to go right the first time I experiment... as I have mentioned before, I am learning to let that go. If you have an awesome resources in mind that could assist me, let me know! 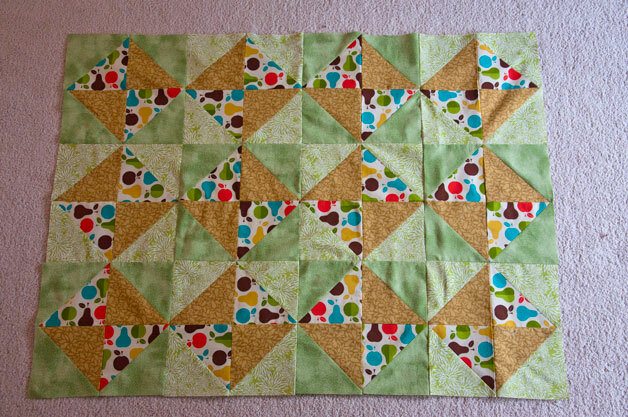 For those beginner quilters out there, I'll be sure to add a little more detailed post at a later date! For now, I just wanted to share what I have completed so far and reach out for some direction! Thanks guys!